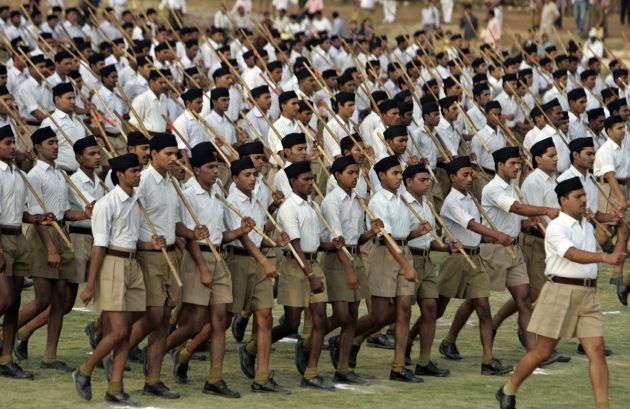 (Photo: REUTERS / Raj Patidar)Volunteers of the Rashtriya Swayamsevak Sangh (RSS), India's Hindu nationalist organization, hold bamboo sticks as they take part in a drill during a training camp in the central Indian city of Bhopal June 7, 2014. The persecution of Christians in the world has climbed for a fourth straight year and a notable statistic is India where persecution has risen over the past year and it can be a high-risk activity, says Open Doors. India has risen to 15 on the list of places where those practising the Christian faith are most likely to be persecuted, with North Korea holding the spot at No. 1, says Open Doors which has monitored persecution over 60 years. "The suffering of Christians simply because of their faith is taking place on a staggering scale. But it is not only Christians who suffer. Muslims, Hindus, Buddhists, atheists and many others suffer persecution too," says Open Doors. It notes that the rights of people from every faith and none to practice what they believe, is enshrined in Article 18 of the United Nations Declaration of Human Rights. "Freedom of Religion or Belief cannot remain the Cinderella of human rights." On average, more than 15 Christians were physically attacked every week in India in 2016. Of India's 1.3 billion, 63.9 million are Christians, with Hindu making up near 80 percent and Muslim 14.2 percent. "Since the Hindu nationalist Bharatiya Janata Party (BJP) came into power in 2014, radical Hinduism has increased steadily," says Open Doors. "There are anti-conversion laws to prevent people from leaving Hinduism in five states, and there have been efforts to impose such a law at a national level. "Some of those who have left Hinduism to follow Jesus have been attacked and even killed by their own parents." Christians are also facing increasing pressure on a national level in India. Five states have implemented anti-conversion laws and the ruling BJP has made no secret of its desire to make these laws nation-wide says Open Doors. It says such laws are often used as an excuse to disrupt church services and harass Christians. "With the Indian government refusing to speak out against the atrocities being carried out against Christians and other minorities, the situation is expected to get worse," said Open Doors. India's Muslim neighbour Pakistan rose to number 4, being the country that faced most violence, even more than northern Nigeria. "Among the numerous atrocities which raised it to fourth place on the list was the detonation of a bomb in a public park on Easter Sunday in Lahore, which killed at least 69 Christians." In Somalia - number 2 on the Open Doors World Watch List – at least a dozen Christians were killed this year by al-Shabaab militants. Militants were also active in neighbouring Kenya, leaving this Christian majority country firmly in the top 20. Mali rose 12 places in the list: three people were killed when a gunman opened fire outside a Christian radio station. In Nigeria, Open Doors found Christians face not only the violence of Boko Haram, but also Muslim Hausa-Fulani herdsmen who have driven thousands of Christians off their lands. And persecution is also "official" policy in some places. The Islamic governments of Sudan and Somalia are actively anti-Christian. As a Somalian believer said, "Everything works against the Christian." And, in Somalia, Kenya, Niger and Burkina Faso, Open Doors found Saudi Arabian money is building schools and mosques, and funding local politicians, leading to an increasing presence of radical Islam in mainstream society.